Long before Silicon Valley came along, cattle rustling was a major crime in the dusty days of Santa Clara County, and on Thursday, sheriff’s investigators were at the scene of what appears to be an old style range war. 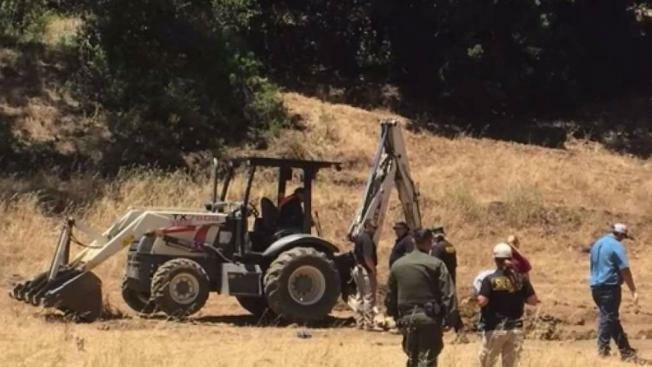 Investigators were digging up huge makeshift graves for at least nine cows apparently killed and buried near Henry Coe State Park, where some sort of dispute over the cattle started. The Santa Clara County Sheriff’s Office says a dispute between cattle owners and a landowner may be connected to the dead cows. The two parties got into a bitter argument last week, and when the cattle owners wanted to take back their 60 head of cattle, the property owner refused to unlock his gate, sheriff's officials said. "Santa Clara County in the past was much more rural than it is now," Sheriff Laurie Smith said. "It’s something that happens in this county. It doesn’t happen often, but this is cattle grazers versus landowners." When the cattle were released, the cattle owners say about 26 cows were missing. Investigators say a hoof was spotted sticking up out of the ground, the sheriff’s special rural unit, armed with a search warrant, began finding and digging up makeshift graves on the property owner’s land. "What we’re looking at is number one, how did the cows die? Was it a firearm? If it’s a firearm, we’ll have to look to see what that is," Smith said. "I don’t think we have the rationale of why yet." Sheriff’s officials say it’s still early in the investigation, and there are no official suspects yet. The cattle owners and landowner could not be reached for comment. Sheriff's officers were still searching the grounds Thursday to see if they can find any of other missing cows.